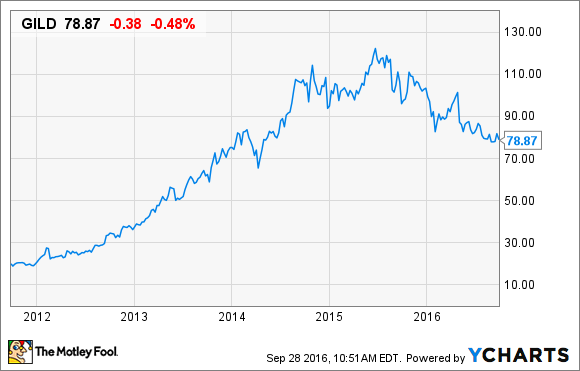 The biopharma's stock looks cheap, but maybe not as cheap as you think. Was it only two weeks ago that analysts at Berenberg Bank were telling us Gilead Sciences (NASDAQ:GILD) stock was undervalued, and primed to deliver investors a 42% profit? Ah, the good old days. Well, I hope you enjoyed them while they lasted, because today, we have a new view for you on Gilead Sciences stock -- and this one's not nearly as optimistic. Yesterday, analysts at Leerink Partners announced that they are taking the opposite view on Gilead, and downgrading the shares from outperform to market perform. The news isn't all bad, of course. Leerink still thinks that at $79 and change, Gilead stock costs less than it's worth. But whereas Leerink previously priced Gilead shares at $112 in value (42% upside -- just like Berenberg had predicted), the analyst's new price target of $94 per share suggests that Gilead stock is only about half as valued as we used to think. Two weeks ago, Berenberg told us that it was placing a lot of faith in Gilead's marquee hepatitis C virus (HCV) business, which uses a series of groundbreaking medicines to not just treat the symptoms of the disease -- but actually cure it. In the face of entrenched competition from the likes of Merck (NYSE:MRK) and AbbVie (NYSE:ABBV) Gilead built this business from the ground up into a $19 billion annual franchise over just a few years. Problem was, though, once you've cured a patient entirely, that patient no longer needs to buy your medicine, and this poses a problem with growing sales. In Berenberg's view, declining sales of drugs such as Sovaldi and Harvoni are likely to fall by nearly half over the next three to four years, bringing in as little as $10 billion by 2019. Leerink's view, however, is bleaker. Moreover, Leerink's dire warning this morning assumes the stock will be collecting "$26 billion in total revenue" (that's HCV revenue, plus sales of Gilead's other drugs) by 2020. That's 20% below today's levels ($32.4 billion in trailing revenue from all sources, according to S&P Global Market Intelligence). It represents shrinking sales in a market where Merck and AbbVie are still growing. (Analysts posit long-term earnings growth rates of 6% for Merck, 16% for AbbVie.) But it's still more than the $24.9 billion in sales that Gilead booked in 2014, a year in which the stock traded broadly between the upper $60 range and well into the $110s. That actually doesn't sound so bad. Additionally, Leerink posits a 64% operating profit margin in 2020, which is roughly equal to what the stock makes today, and what it made in 2014 as well. This, then, is basically the decision investors must make today: Assuming the analysts are right, Gilead's HCV sales are in a long-term downturn, and the company has no chance of replacing those sales with new drugs, is it worth paying less than seven times earnings and free cash flow for the stock today, knowing that those earnings and free cash flow will both be less, a few years from now? Berenberg says yes. Leerink says no. Check out each analyst's record on Motley Fool CAPS today, and decide for yourself which one you think is right.